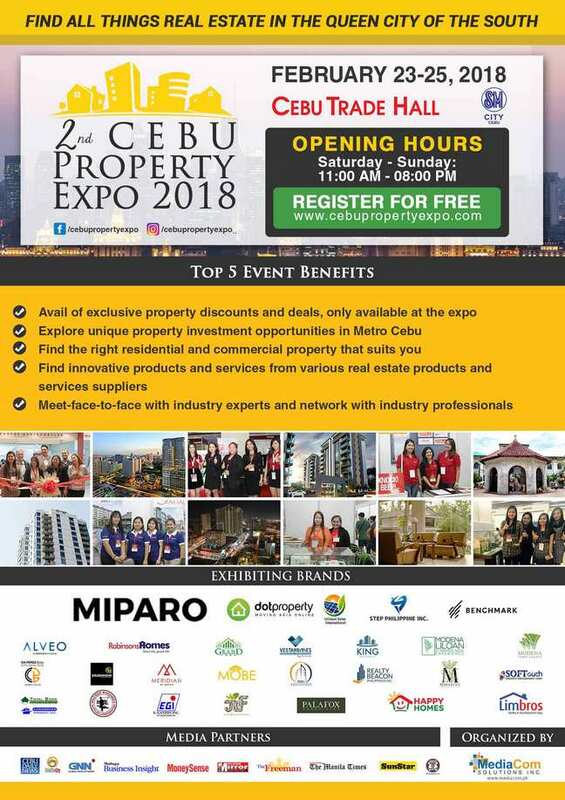 The Country’s Largest Real Estate Show in the Queen City of the South, the 2nd Cebu Property Expo [CPE], is set to launch on February 23, 2018, at Cebu Trade Hall, SM City Cebu.The event will run for 3 days at the Cebu Trade Hall, SM City Cebu where top property developers and home suppliers in the Philippines and in Cebu will all be showcased. Recognized as the premier destination of business outside Metro Manila, Cebu has undergone a significant transformation in the last few years in the Real Estate Industry. Property values have been on an upswing as Cebu transformed its skyline with large-scale residential, commercial, retail and hotel developments. Leisure activities supporting Cebu’s businesses are also in place to entice a broader range of visitors and tourists, said a report of Colliers Philippines. With the tagline “Find All Things Real Estate in the Queen City of the South,” the event will feature over 40 Exhibitors with more than 70Real Estate Projects and Home Suppliers, Real Estate Brokerage Firms, Real Estate Marketing Agencies, Property Investment Firms and Consultancies, Vacation Membership Clubs, Home and Office Furniture, Construction Suppliers, Home Technology Solutions, Real Estate Online Portals and is expected to be visited by over 5,000 visitors. The event will also host the 2nd Cebu Property Summit (CPS) that will feature 10 Speakers from the Real Estate Industry. CPS is the premier real estate conference and networking event for Real Estate Professionals, to be held on February 23, 2018 (Friday) from 10:00am-06: 30 pm at the Cebu Trade Hall, Meeting Rooms A-C, 3rd Level, SM City Cebu, Cebu City. 2nd Cebu Property Expo is sponsored by Miparo Philippines; Utilisun Solar International, Step Philippine Inc., and Benchmark. Other participating brands are Robinsons Land, Grand Land, Alveo Land, King Properties, PalafoxAssociates, Vestahomes, Softouch Property Development Corporation, E. Ganzon, Total 2000 Corporation, Eurobrass Products, Agro-Macro Development Corporation, JLF Craft & Accessories, Green Grace Success, Mobe, CH Perez Bros Consultancy Corporation, Limbros Realty Development Corporation, Wacker Machines Supplies Corporation, Realty Beacon Philippines Incorporated, and RBG Philippines. For exhibition or sponsorship inquiries contact David Abrenilla at +63-2-509-4792, +63-927-395-1575 or email david@­cebupropertyexpo.com.